It is emblazoned on the POW/MIA flag, but I wonder how many people have already forgotten that there is a young Soldier who has been held by the Taliban in Afghanistan for over a year. 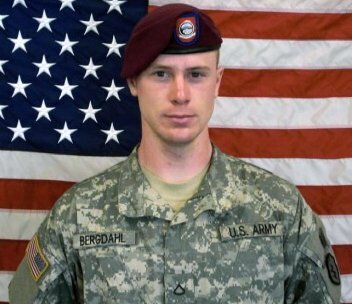 His name is Specialist Bowe Bergdahl, and he was captured in late June of 2009. Since then, several videos have been released of him, but his plight has faded from the news. But his family hasn’t forgotten. Nor has his home town of Hailey, Idaho. And Donna Thibedeau, she hasn’t forgotten either. Donna is a rancher from Malad City, Idaho, a small town of around 2,000 people sitting in the extreme southeastern corner of the state. Her heart is as big as her town is small. She rescues and cares for horses in distress. She offers – free of charge – horseback riding as therapy for veterans suffering from Post Traumatic Stress. This mother of seven still wanted to do more. So to keep the memory of Spc. Bergdahl alive, she donated a horse to him and walked it over 200 miles to his parents. 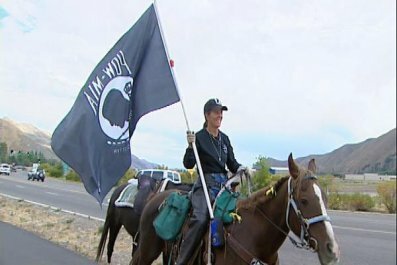 Along the way she wore POW/MIA logos on her clothing, and when she finally arrived in Hailey she unfurled a large POW/MIA flag that she carried through town. Later, she headed to Pendleton, Oregon to raise awareness at a local rodeo, and challenged other riders to log their miles when they rode. Her goal is to collect a combined 8000 miles on horseback – roughly the distance Bowe is from home right now. She is one who has never forgotten. There are a lot of great people in this country. Donna Thibedeau is one of them. She is our hero of the week. To read more about her efforts, read “Horseback rider dedicates endurance ride to missing Idaho soldier.” There is an accompanying video in the article too. I just wanted to say that this was an honor to ride for our POW and his family. It is so important that as Americans we do everything we can to support our troops and their sacrifices. I look forward to the day that Bowe returns home and can accompany me on a mountain ride in our beautiful country and i can thank him in person for all that he did for me. A sacrifice that I could never repay. I just want to remind people that this young man has been away from his family for almost two years now. Please do not forget him, please continue to pray, we continue to ride miles for him to remind others.